I was flicking through Instagram one day and I read a caption that included “cereal milk ice cream” and I pulled an ugly face and began to ponder what such a thing might be. Ew, what?!? Wait, what?!? Hmm. So at the grocery store Rob and I are walking around and I casually mention this to him because, as you probably have figured out, I’m in a full swing freaking ice cream making ADDICTION. And as I’m stacking half a dozen cans of condensed milk into our cart while the guy trying to stock it looks at me like I’m a total freak of nature, I turn to Rob and inform him that if it was FRUITY PEBBLES cereal milk, well, that is a whole different story, right? The milk left behind with Fruity Pebbles is pretty much the nectar of the gods, right? Right! 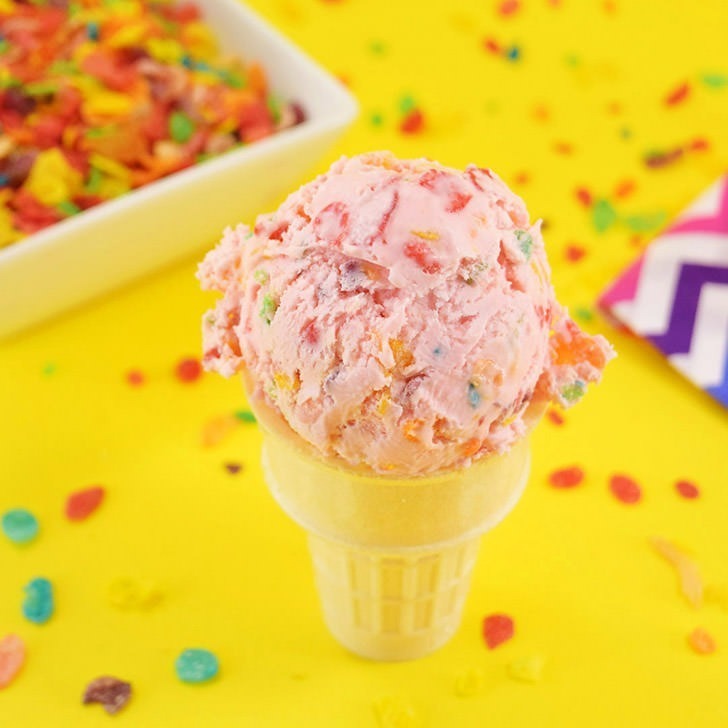 And so I came home and made a big batch of my very own batch of Fruity Pebbles cereal milk ice cream and we abso-freaking-lutely loved it and began thinking that you could really do a TON of flavors well. Rob mentioned Cinnamon Toast Crunch and I think that Captain Crunch (if I could still have it, boo!) would be AMAZING. Basically any of the cereals that don’t try to sneak flax seeds or quinoa or other healthy junk into them would probably work super well! 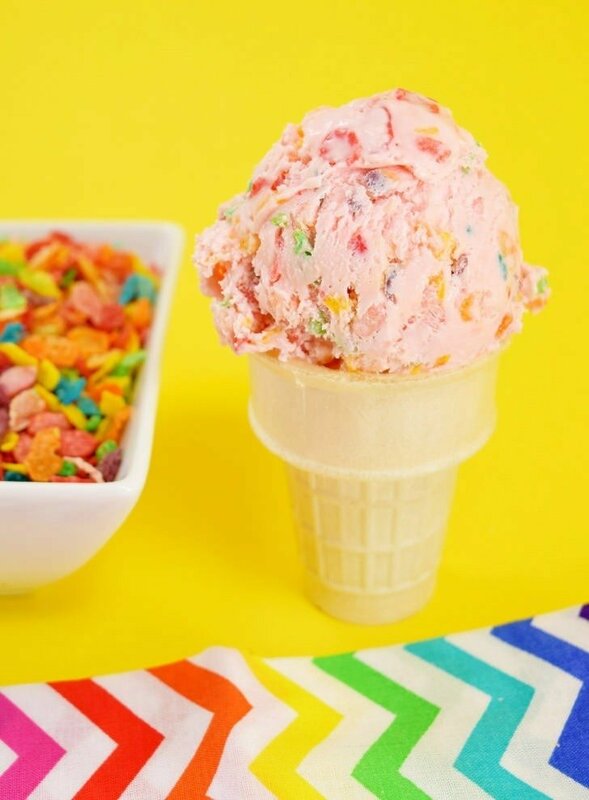 Now in the recipe below I include the cereal in the ice cream itself. If you’re a texture eater this might get weird for you. The cereal becomes kind of chewy/powdery. I didn’t mind but if you do you can eliminate dry cereal and instead soak the cereal in the milk for your recipe and strain the cereal out before proceeding. The flavor will transfer to the milk and no weird texture issues! 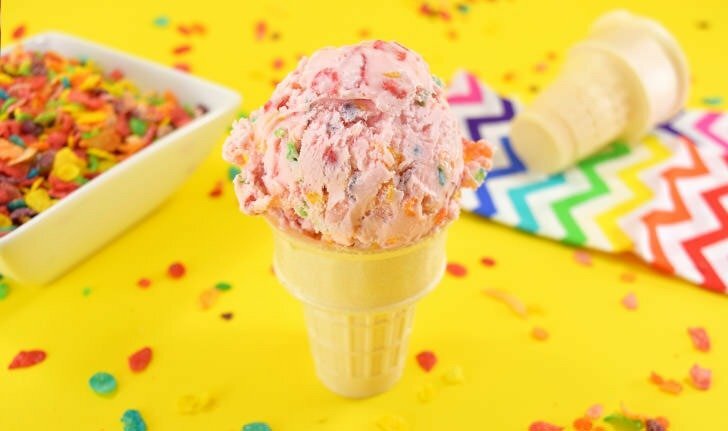 If you love eating cereal for a sweet snack, or sometimes even as dessert, you’re going to absolutely love this cereal milk ice cream. 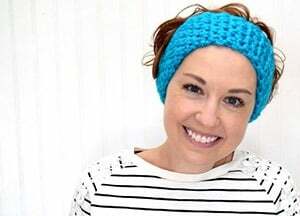 It’s the perfect way to use up slightly stale cereal and can be used in your favorite flavor. Some suggestions off of the top of my mind include, Fruit Loops, Apple Jacks or Captain Crunch! For larger cereal it’s advisable to crush or chop into much smaller pieces for the best flavor. This recipe is no churn and ice cream machine required. In a stand mixer or with hand beaters combine heavy cream and sweetened condensed milk until soft peaks begin to form. Fold in 1 to 1.5 cups of cereal (to taste). Place in a rubber container and seal. Allow to freeze 3-4 hours, though overnight is best.